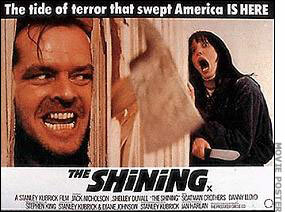 100 things to do in 1000 days; #34/45: Watch The Shining. The point of this project was to watch and enjoy excellent old(er) movies I would never otherwise have seen, not to spend 7 hours (what do you mean it was only 2?!) watching Jack Nicholson play himself, and then “shockingly” remain a psycho for the entirety of the movie. But now I get a LOT more of Matt Groening’s references, so…mission accomplished, I guess. 100 things to do in 1000 days; #34/35: Watch The Shawshank Redemption. It turns out, this movie is not a version of Good Will Hunting with a main character whose last name is Shawshank. Who knew? Although, actually, I haven’t seen Good Will Hunting, either, so the plot that I incorrectly assumed Shawshank was ripping off for some reason may be a completely different composite plot I came up with because I have seen about no movies, but all of the TV, and the multitude of oblique references contained within have congealed into nonsensical soup of movies that never existed. I blame Community. I really like this type of movie – these wonderfully thought out storylines with small, meaningful moments that give sprawling narratives a throughline, the beginning connecting with the end in a way that feels beautiful and inevitable – it reminded me of the Count of Monte Cristo. I’m not actually high, right now, just tired. It took a little time to get going, but sometimes slow starts make for the best movies, because when you finally care about the characters, it’s because you spent time with them and they mean something, not because of good-looking actors, empty charm, or cheer-baiting one-liners. I really enjoyed The Shawshank Redemption, and I would like future Donna to know, just in case she’s forgotten, that it’s worth watching again. I put the entertainment section in my List to force me to watch movies like this, that I may never otherwise get around to seeing.